The secret to Chinook Chem-Dry’s clean, is the millions of microscopic, carbonating cleaning bubbles in our cleaner we call The Natural®. This carbonating solution penetrates very deep into the base of your carpet, exploding grime and dirt off of the carpet surface. We then use hot water extraction to lift the dirty particles to the surface where they are easily vacuumed away. This carbonation process is almost identical to using club soda to remove a stain from a shirt. The awesome cleaning power of the carbonating solution creates a powerful reaction that deep cleans your carpets and upholstery in a safe and gentle way. Due to the natural power of carbonation, Chinook Chem-Dry does not have to use excessive amounts of moisture to clean your carpet or upholstered items. Because the bubbles do the work for us, Chinook Chem-Dry does not need to use soapy and sticky cleaning chemicals that other cleaners and do-it-yourself machines rely on so much. Soapy residues have a tendency to attract dirt like a magnet, causing your carpet to get dirty even faster than before. 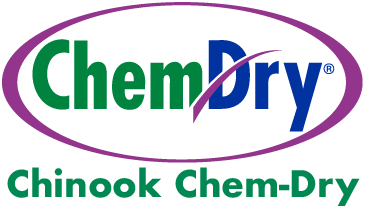 Chem-Dry’s primary carpet cleaner contains no soaps, detergents or surfactants. You can save money when your carpet stays cleaner longer. Fewer carpet cleanings mean a better bang for your buck and one less thing on your ‘to do’ list. Carpet stains reappear in the same place after cleaning for two reasons. First, they were never thoroughly removed. Often the unwanted stain gets forced down below the surface of the carpet by a high-pressure steam cleaning unit, only to resurface when your carpet dries. Secondly, the cleaning solutions used by most steam cleaners create a sticky, soapy residue that attracts more dirt and soiling to the carpet. Through the use of Chinook Chem-Dry‘s carbonated carpet cleaning solution, Chinook Chem-Dry can thoroughly remove stains more quickly and efficiently. We apply our solutions so sparingly, and without high pressure, resurfacing of stains is not a problem. However, if a spot does reappear, just let us know and we will work until the problem is solved.